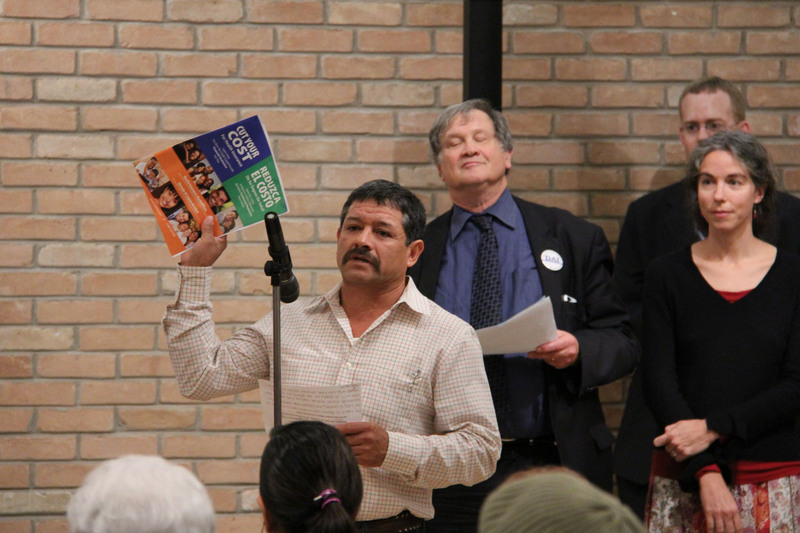 Pages tagged "Network of Texas IAF Organizations"
On the heels of COPS / Metro's recent disruption of business-as-usual at a public budget hearing, District 4 Councilmember Rey Saldana took up the cry for a higher minimum wage for City employees. "Councilman Rey SaldaÃ±a said that while he supports giving relief to taxpayers, he also would support leaving the rate the same if the funding helps increase wages for the city's lowest-paid civilian employees. Communities Organized for Public Service and the Metro Alliance have been advocating for the increase, which has been backed by some council members." At a graduate recognition ceremony for 200 Project Quest students, Executive Director Sr. Pearl Ceasar and Boardmember Sr. Gabriela Lohan -- both instrumental in the creation and implementation of the long-term workforce development program -- congratulated each one on stage. Three hundred leaders from Dallas Area Interfaith assembled at Temple Emmanu-El in North Dallas to kick off an affordable care campaign aimed at explaining the federal healthcare exchange. Marjorie Petty, Region 6 Director of US Health & Human Services, praised DAI, asserting they "have done an amazing amount of work in just six weeks" and is "a model for others around the country." With the aid of multi-colored booklets that clearly lay out how uninsured individuals can participate in the federal exchange, which the healthcare action team of DAI produced, leaders hope to reach hundreds of thousands of uninsured.